On Wednesday November 16, 2016, the City of Toronto’s Film & Entertainment unit is partnering with Indie Week and Music Ontario to present a free info session for composers, songwriters, music creators, and musicians on generating income via sync placement and song licensing. Following the event, Indie Week will present their 1st Annual Artist Mega Showcase featuring Live From City Hall alumni Ginger Ale & The Monowhales, with Brad Fillatre, Jillea, and more to be announced. 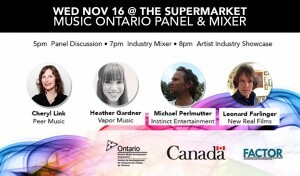 For more information and to RSVP to the free session, visit Indie Week’s event page.